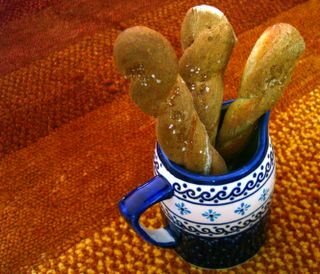 I have made breadsticks before, and though they were tasty and easy to make, I have wanted to pin down a good recipe for yeasted breadsticks. I wanted to get that nice texture that you just can’t seem to get with a quickbread (non-yeast) type of recipe. Many recipes for homemade breadsticks are really just elongated dinner rolls, tending towards softness. Truthfully, I like those types of breadsticks, but I really wanted something crunchy, but not too hard, and flavorful. These seem to fit the bill. The recipe starts with a yeast dough that has dried herbs added to it, adding a relatively mild flavor that would complement many dishes. The dough is smooth and easy to handle. To shape it into those lovely twists, I just rolled the dough into long snakes, folded in half, and twined the loose ends together. The trick to getting them crispy is in the baking. It seems that you need a high temperature and a relatively long baking time, compared to the size of the breadstick. I ended up baking them at 425F until they were a dark, golden brown all over. This produced sticks that were wonderfully crunchy on the outside and still a bit soft at the center. The long baking time did dry the center of the breadstick slightly, but this is a breadstick that is meant to be dipped in soups and sauces, soaking them up and adding a texture contrast. In short – it doesn’t matter. If you are a die-hard soft breadstick person, only bake them for 15-20 minutes, until they are light golden, firm to the touch and sound hollow when lightly tapped. Also, if you know your oven has hot spots in it, I recommend rotating the pan once during baking to avoid over-browning (a.k.a. burning) any of the breadsticks. In a large bowl, combine the yeast and the water. Let stand for 5 minutes, until slightly foamy. Add in vegetable oil, sugar, sald, dill, parsley, carraway seeds (if using) and 2 1/4 cups of flour and mix well. Add remaining flour a tablespoon at a time, stirring until the dough comes away from the sides of the bowl, adding a little more if necessary. Turn out onto a lightly floured surface and knead for 3-5 minutes, until smooth and elastic. Place dough into a lightly greased bowl, turn to coat, and cover with plastic wrap. Let rise for about 1h15min, or until doubled in size.Once the dough has risen, divide it in half. Working with one half at a time, roll out into a large rectangle that is about 1/4 inch thick. Cut it into four strips (a pizza cutter will work well), then take each strip, roll it into a “snake” about 18-inches long, fold in half and twist together. Place twist on a lined baking sheet. Repeat with the second half of the dough to make 8 breadsticks. Cover the baking sheet with a clean dish towel and let rise for about 30 minutes. Meanwhile, preheat the oven to 425F. When the breadsticks have risen, very lightly brush them with water and sprinkle with a bit of coarse salt. Bake for 20-25 minutes, or until dark golden all over. Let cool to room temperature (or slightly warm) before serving. Note: To refresh them, since they will loose their crunch overnight, just pop into a 350F oven for a few minutes â€“ but thereâ€™s no shame in having none left over, either. These sound wonderful. I’ll have to try these! Sounds good, I love breadsticks! Thanks, anonymous. I guess I was typing too fast again! Hi: I have a couple of questions. Thanks a lot, i’m now all kicked up to try other stuff from your cooking school.